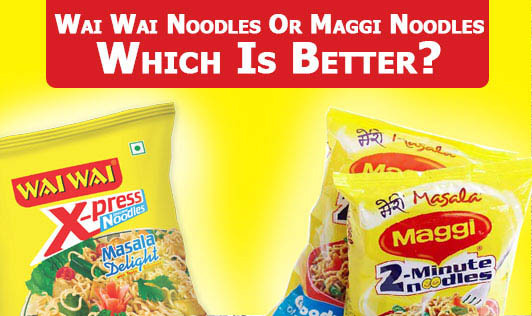 Wai Wai Noodles Or Maggi Noodles - Which Is Better? Wai Wai noodles have been recently launched into the Indian market from Nepal, as competitors to maggi, foodles etc. Unlike other noodles, wai wai noodles are pre cooked, flavored and fried. It has 3 seasonings varieties to add to the taste buds. Claims: Power packed with Vitamins and Minerals to help develop your child's Brain, body and bones. Is it true? Then a packet of noodles on regular consumption is enough for any children to help in growth and development and build immunity. 1. Calories: 375 kcal, Total fat- 16.6g and off which 7.2g of saturated fat and 0.6g of Trans fat. But their highlight is on the fortified nutrients like iron, vitamin A and calcium that help in child's brain, body and bones. 2. "So Tasty and So Healthy" - which is why it is more than just a junk snack and a great nutritious meal. 3. Contains Mono sodium Glutamate (Ajinomoto) which is not recommended for Infants. It is just 2 minutes of preparation and can keep you full for a long time. Is it not that the noodle is high in saturated fat or trans fats? Trans Fat had been banned in India due to its negative health impacts on lifestyle diseases like cardiovascular, obesity and cancer as an emerging disease. Research is going on to get more information about its health hazards. Studies on the side effects of Ajinomoto are also still going on to bring conclusive evidence. Speaking about the Maggie noodles, we know that even though it has high fat content like any other noodles, it has zero saturated fats, trans fats and Ajinomoto. Maggi or Wai Wai, both have their pros and cons.....As a time factor and for worth of money, noodles may seem to be a quick better breakfast option but not a major meal option, as it lacks in micro nutrients. As wai wai claims I agree with the taste but will not compromise on the health factor. And Maggi noodle can be a better choice to wai wai due to their nutritional aspects. How about you? Have you given a thought on Wai Wai or Maggi?